As search engines take on new smarts seemingly with each passing day, consumers gain access to quality information that can presumably make our lives easier. But it leaves marketers scrambling. Major algorithmic changes can require rethinking your content strategy and endlessly working to ensure content both old and new gets found. One way to make all these changes easier on yourself is to create a content marketing taxonomy using semantic topic models. Find out how in this Memo to the Modern Marketer. Taxonomy comes up fairly frequently in content marketing, but it’s typically used in creating a sort of workflow. Here, we’re going to use it to support content strategy backed by data. First off, we should understand that taxonomy is a method of classification, but it’s used when there are hundreds of items or ideas to group and categorize in order to create order out of chaos. Glenn McDonald, the taxonomist for Spotify, created Everynoise.com as a mind-blowing example. 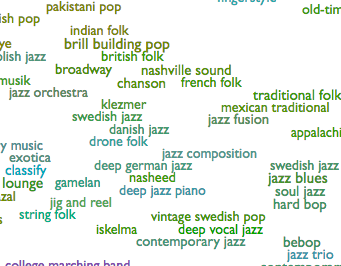 It shows the relationship between every genre of music using colors and word clusters. You can see by the light forest green of “klezmer” and its proximity to “Nashville sound” that it has some of the same style as “jig and reel” and when you click on each of those, you can hear the similarities. Creating content marketing taxonomy doesn’t have to be this complex; using semantic topic modeling can simplify it for you. The goal is to help search engines return results as close as possible to the exact answer for a question that it’s has similar question posed in natural language. Those with just a small command of SEO know that search engines attach context to terms entered into a search. That’s what you should be thinking about when you structure your semantic topic modeling. A common method of topic modeling is Latent Dirichlet Allocation (LDA). LDA reads a page as a cluster of topics. At the same time, it reads each topic as a cluster of related words and analyzes it. It’s similar to what the Searchmetrics Content Experience uses for the Topic Explorer function. Put simply, Topic Explorer does performs LDA in reverse by taking the primary filtered search query and identifying related search queries and presents a visualization of how the main topics overlap with the secondary topics. Let’s take a look at the future of the British Royal Family. With Prince Harry’s impending nuptials, curiosity about his betrothed, Meghan Markle, the American actress and divorcee, earned her the title of Google’s Most Searched Celebrity for 2017. The bubbles show that there’s a bit more interest in Markle with regards to Prince Harry, his ex-girlfriends and his brother. When you’re developing your own taxonomy, Markle would be one small piece of your overall content. As the wedding day nears, more topics would be added and more grouping and connecting would be needed: wedding dresses, flowers, bridesmaids, for example. They’re items you may already have content for that should be updated and re-optimized, or that you need content for in another capacity; keeping it sorted can help your content win. The topic modeling also opens up opportunities for unique content that you may not otherwise think about. 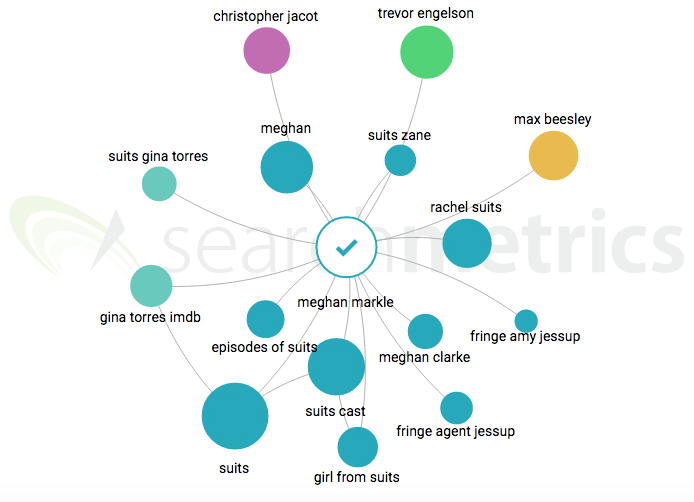 For instance, if you think about search intent, you might glean from the US clusters that users want to know how the Suits crew will write Markle out of the show when she leaves her career behind to become the Duchess of Sussex. Will they kill her off? Will another actress move into the character? Will Mike be able to move on after she leaves? Who will his new love interest be? Will the show maintain its status as the 9th most popular TV show in the world (according to Parrot Analytics) without Rachel Zane? Good taxonomy could create an excellent opportunity to answer the questions users are asking. 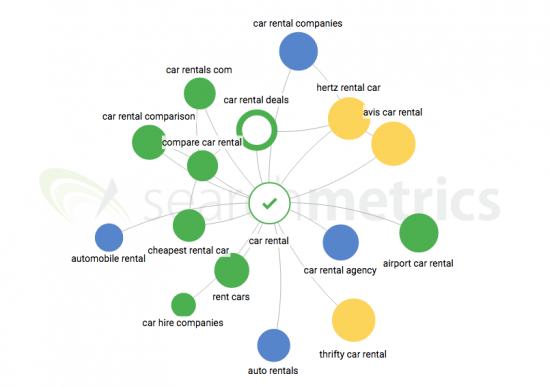 Having your topics mapped out kickstarts your keyword research. You probably already know what keywords you rank for. Now, you can connect them semantically. With all of your topics and subtopics categorized, you can see which topics can bolster your rankings for certain keywords, and you can fill in the gaps for keywords you want to rank for. As you create content, you now write from an intent and relevance perspective and use keywords that show off the right context on pages that use the same meaning on other pages. For this, your taxonomy should be broken down by the three types of searches: navigational, informational and transactional. Take Kayak.com as an example. If a user inputs “kayak,” he or she may be looking for types of kayaks (informational search), or the searcher could be looking for the online travel agent site kayak.com (navigational). If the user punches in “cheap flights to Greece,” that would indicate the user is looking for a plane ticket (transactional), leading the user to kayak.com where they can book the flight. 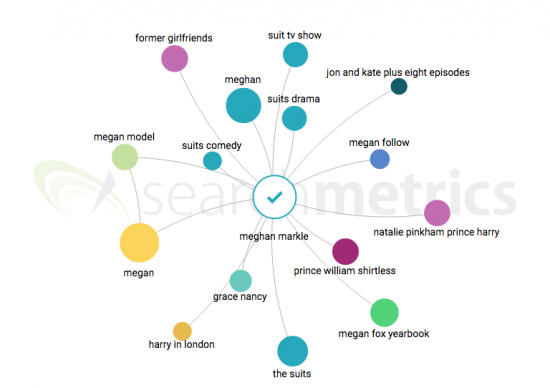 The Searchmetrics Topic Explorer breaks down intent for keywords. 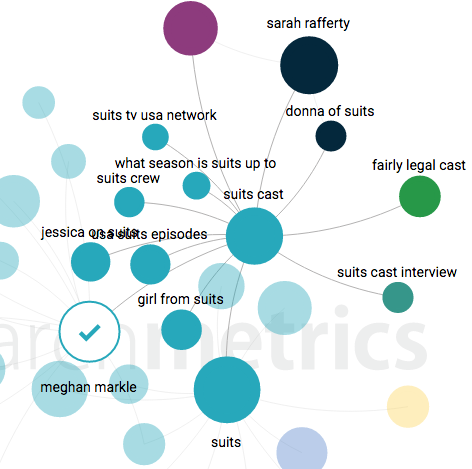 Here you can see different colored bubbles — they’re topics clustered by search intent. The bubbles indicate keywords grouped blue for informational search, yellow for navigational, and green for transactional. Clicking on a bubble shows you the search volume for the different search intent categories. Incorporating keyword research broken down by intent in your overall taxonomy can help you measure your overall strategy at a granular level. While your company’s SEO is working on your site’s architecture, this content taxonomy is your content architecture. The more structure you have, the easier it is to make connections between your content and your content goals. It aids customers in finding the information quickly while also giving them highly targeted, accurate and detailed search results. It acts as a guide for who, what, where, when, why, and how to create and execute your strategy. The better the organization you have for your content, content marketing plan and keywords, the more you have to measure, analyze, adjust and measure your content again. This also helps you build a more complete profile of your target customer. With this much structure, you can see the holes for your audience that your competition is filling in – and when you can see those holes, you can be the one to fill them. While search engines are tweaking their algorithms to improve user experience, content marketing taxonomy using semantic topic modeling can help content marketers stay in lockstep with Google and Bing, and bring users relevant information when they want it. Content marketers don’t know exactly when that is, but with the right taxonomy, we can gather enough data to narrow down approximately how and when to deliver it.